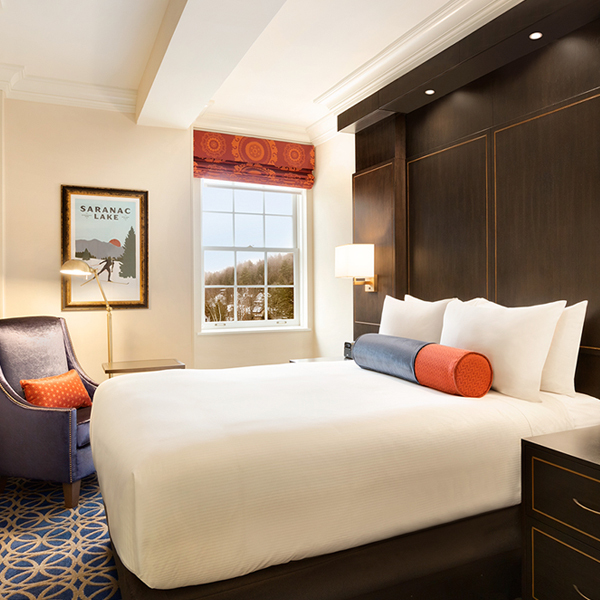 Freshly renovated and sporting all the amenities found in a chic boutique hotel in the heart of Manhattan, you won’t find a better night’s rest anywhere else in the Adirondacks. Our king bed guest rooms are beautifully decorated and include the comforts of a king-size bed with luxurious linens, along with custom bolster pillows. Each guest room offers a 55-inch TV, alarm clock radio with Bluetooth, settee, phone with voicemail, iron, ironing board, and hair dryer. Our deluxe king bed guest rooms are beautifully decorated and include the comforts of a king-size bed with luxurious linens, along with custom bolster pillows. Each guest room offers a 55-inch TV, settee, work desk, mini-fridge, alarm clock radio with Bluetooth, phone with voicemail, iron, ironing board, and hair dryer. Our queen bed guest rooms are beautifully decorated and include the comforts of a queen-size bed with luxurious linens, along with custom bolster pillows. Each guest room offers a 55-inch TV, alarm clock radio with Bluetooth, phone with voicemail, iron, ironing board, and hair dryer. Our two-queen guest rooms are beautifully decorated and include the comforts of queen-size beds with luxurious linens, along with custom bolster pillows. Each guest room offers a 55-inch TV, mini-fridge, alarm clock radio with Bluetooth, phone with voicemail, iron, ironing board, and hair dryer.